In writing you want the reader to be grabbed within the first few sentences so they want to keep reading. It's pretty impressive when that intrigue happens with the title of the book before the reader even gets the cover open. 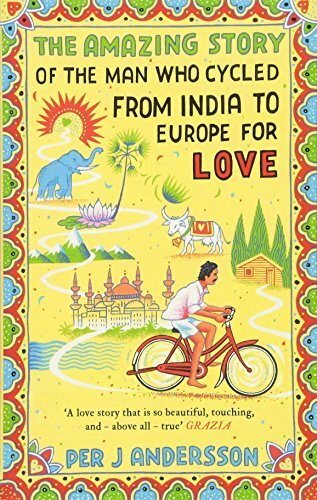 A man rode a bicycle from India to Europe for love? Now that's a story I'd like to read. Unfortunately that's not exactly the bulk of the story told in Per J. Andersson's piece of long form travel journalism/history/biography here. Instead it's a blend of Indian history with a heavy emphasis on the caste system and the plight of the Dalits (untouchables) through the eyes of one man who eventually followed the woman he loved to Sweden. Padyumna Kumar (known as PK) was born in a small village in India. His family were Dalits and this fact colored every day of his life, from school to worship to others' treatment of him in general. Despite the many, many road blocks placed in his path, PK was intelligent, artistic, and determined so he moved to New Delhi in search of a better life and perhaps also in search of the woman mentioned in the prophecy made when he was just a baby that declared he would marry a woman from far away, outside the country. Andersson tells of PK's life in the capital, occasionally veering from it to tell of a young Swedish girl, Lotta, who had a fascination with and a pull towards India. The bulk of the story, however, is not Lotta's life, it is PK's, which weaves in the injustice and inequity in the social system in India but also shows the incredible experiences and helping hands that PK found in progressive and friendly people as he eked out a living in New Delhi and as he eventually sets off on his bicycle to reunite with Lotta. The book has a long, slow build-up that made it unfortunately easy to put aside in lieu of other reading. It also seems to be unable to decide if it is the story of a poor Dalit artist in a slowly changing India or a love story or a history or a travelogue. It has elements of all of these, leaving the book to feel unfocused and clumsy. Perhaps this is a function of the translation but I suspect not. This is a true story and should have all the nuance of a good non-fiction work but it doesn't really. PK is the best fleshed out while Lotta lacks the depth to be the real person she is and their love is presented as almost fait accompli simply because it's fated. It is supposed to be such a strong love that PK chooses to hop on his bicycle to find her many thousands of miles away and yet there's little given to the reader to actually show how that love came about. There is a lot of the book to get through before PK starts out on his crazy journey but the actual journey and his life in Sweden with Lotta are given fairly short shrift in the end. I don't know whether I wanted a more sweeping love story or a deeper history or a more detailed travelogue but that is perhaps the biggest problem with the book: it gives you just a tiny bit of each and none of them stand on their own as complete in the end.